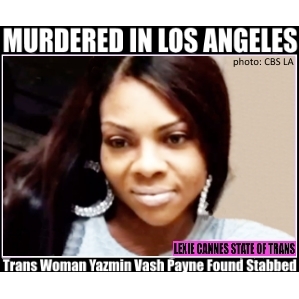 “The partner and roommate of a transgender woman found fatally stabbed in a Van Nuys apartment last weekend has been charged with suspicion of murder and “arson of an inhabited property,” the L.A. County District Attorney’s Office announced. The suspect has pleaded not guilty. The body of Yazmin Vash Payne, 33, was discovered about 5 a.m. Saturday following a fire at an apartment in the 14600 block of Saticoy Street, police said. Original article: We’re in the midst of a horrid string of reported transgender murders. In this makes the sixth trans murder I’ve written about in this space during the last 5 days. The death tally so far: Texas, Virginia, Kentucky, Pakistan, Austria and now, Los Angeles. All deaths occurred between the second week in January and the last day of the month. Police in Los Angeles have yet to release the identify of a trans woman stabbed to death in her Van Nuys apartment on the morning of Jan 31. Her body was found in the kitchen by firefighters who were responding to a fire in a bedroom. Police are looking for the victim’s boyfriend who was heard arguing with victim just before the fire. ‹ Transgender-hate monger Bryan Fischer FIRED! Mainstream media is covering those stories. Please refrain from using the word “ridiculous”. We don’t need any further triggers. Thank you. You’re welcome to post your opinions, but the use of certain words invites a flame war, not to mention set some into a downward spiral. Yes, things were much, much worse in the past, and elsewhere around the world today, but this doesn’t mean we should back off the gas because things are “relatively better” today. A person killed today just for being trans is just horrific as it was decades ago. Trans people have yet to achieve the level of equality and protection afforded many other marginalized groups. Events elsewhere around the world have no bearing on achieving equal parity. Why are you derailing the publication of this horrible topic?